MormonInfo.org - FAQs - Doesn't the same DNA evidence that discounts the Book of Mormon discount the biblical account of creation? 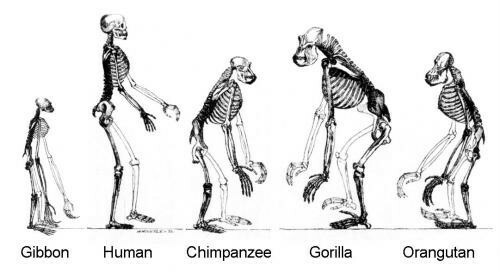 Ape Hominoid skeletonsThe question of whether the Bible is committed to the theory of evolution or not is a matter of long-standing debate. Prima facie, a more literal understanding of the passages in Genesis chapter 1 which speak of the various living things being brought about after their kinds would seem to rule out an evolutionary viewpoint. But perhaps a more figurative understanding of this chapter is called for. Similarly, Martin Luther famously argued for a geocentric solar system (Earth is the center rather than the sun, and the latter revolves around the former) on the basis of Joshua commanding the sun to stand still during a certain battle that Israel was engaged in (Joshua 10:12-13). For Luther, of course the sun circled the earth; the Bible clearly taught it. Yet today most of us don't think this is a good reason to buy a geocentric view. We still talk about the sun rising or setting, but most of us talk figuratively in such cases. So as Dennis Monokroussos pointed out in his film review of DNA vs. The Book of Mormon, the Bible has room for various viewpoints on the subject of creation. On the other hand, a figurative understanding of the central story line of the Book of Mormon is not as clear. The Book of Mormon teaches that Israelites coming over to the New World populated it as "the sand of the sea" (e.g., Mormon 1:7). But many LDS, in order to answer the problem that DNA evidence is not turning up anything of Israeli origin, are opting for a limited geography with a small population, which is yet to be discovered. Now if the Bible is understood in more literal ways to rule out evolution, then how does such an understanding fit with the DNA evidence that seems to point to common ancestry? An Evangelical Christian scientist, John Bloom, claims that the difference between humans and chimpanzees in terms of their DNA is 2% with a .03% difference in their proteins. According to Bloom, "[I]t has been deduced [by modern science] that a hypothetical last common ancestor to man and African apes existed as recently as five to seven million years ago." But Bloom finds that it is just as reasonable to suppose a common designer or engineer from these facts. Evolutionary theory of common ancestry may still turn out to be true, but using DNA evidence alone should never be treated as a sufficient reason for upholding the theory. For more on this, please see the article by Christian Answers.